There’s rumors swirling that Gray Motorsports Pro stock driver Dave Connolly will be making the switch to Bob Vandergriff Racing next season. If this move does take place, it would be the first time that he has piloted a Top Fuel dragster. Neither Connolly nor Vandergriff Jr. would comment on this potential move. The veteran Vandergriff Jr. is expected to step out of the car following the 2014 season. The 49-year-old would like to spend more time with his wife and four kids. While he wants to do that, the expected plans are to have a two-car team next season. One of those cars is supposed to be driven by Connolly, who has driven Top Dragster in the NHRA Lucas Oil Drag Racing Series before. The second car is supposed to be driven by Larry Dixon, who is currently driving the second car this season. Vandergriff Jr. has made it to two semi-finals appearances this season. These semi-final appearances came at Bristol in June and Denver in July. He has been eliminated in the first round in the past three races. His last win came at Houston of last year with his other two wins coming in 2011 at Dallas and in 2012 at Las Vegas 2. Connolly is in his first year back in a full-time Pro Stock ride following several years without a ride. His lone win this season came at the NHRA New England Nationals in Epping, New Hampshire. 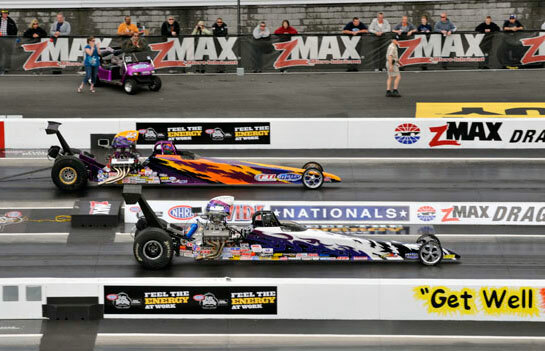 Dixon hasn’t been in a full-time ride since the 2011 season when he was in the Al-Anabi Racing Top Fuel dragster. Since that time, he has competed in 16 events with different teams, racing limited schedules for Dote Racing, Rapisarda Autosport, and Vandergriff Jr. Racing; he has been working on starting Larry Dixon Racing. Dixon has 62 career wins, all in Top Fuel, trailing Tony Schumacher by 13 wins for the most all-time. Casedhole Solutions and Total Equipment and Service (T.E.A.S.) is the sponsor of the three-time Top Fuel Champion’s dragster for his 10-race schedule this season. Two years ago, Bob Vandergriff Racing was a two-car team. Clay Millican joined BVR, while keeping his own sponsors. The two decided to go their separate ways following the 2013 season.